Easter is a rare opportunity to get on with some serious writing. I am in the midst of three major writing commitments. It has also proved quite productive in that a copy of the latest issue of Pouvoirs – the leading French journal of political science – has just arrived, which carries an article of mine on fixed-term Parliaments. I have also received the proofs of two forthcoming publications: a chapter on ‘Comparing Leadership Patterns and Dynamics in the Legislative Arena’ for a forthcoming book on Comparative Leadership and a short response, covered in an earlier post, to an article by Arthur Aughey in the journal Policy and Politics. Both should be appearing in print in the not-to-distant future. 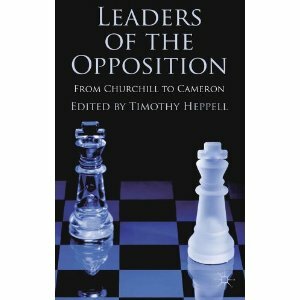 I have also just received – hence this post – a copy of Leaders of the Opposition from Churchill to Cameron, edited by Timothy Heppell, which contains my chapter on Margaret Thatcher, analysing her period as Leader of the Opposition (1975-79). Her time as Opposition leader was not particularly successful. Had James Callaghan called an election in 1978 and Labour won it, it is likely Mrs Thatcher would have gone down in history as an also-ran. Both Thatcherism and the effective style of leadership associated with Thatcher emerged after she entered Downing Street and were a consequence rather than a cause of her electoral success in 1979. It was not so much that the Conservatives won the election as Labour lost it. This entry was posted in Uncategorized and tagged Leaders of the Opposition, Margaret Thatcher. Bookmark the permalink. It’s interesting to read your opinions on Thatcher. I’ve often wondered what would have happened to the Conservative Party if she had never become leader, considering the effect that Thatcherism has had over the years. Would the Tories be liked more in general? It’s worth thinking about, because when I talk to people affected by her politics, they don’t always have good words to say. Then again, there could have been another leader with a similar style. Life: Donloaded: Indeed, what if (a) Heath had been more adept at keeping in touch with backbenchers and remained as party leader, or (b) Sir Keith Joseph had not made his disastrous speech on birth control and been a candidate for the party leadership and won, or (c) Callaghan had called a general election for the autumn of 1978 and won? Thatcher was an unlikely candidate for the leadership – she initially had only a small body of followers – and won because the parliamentary party wanted to get rid of Heath. Mind you, if the people you talk to don’t have a good word to say about Margaret Thatcher, you may need to get our more. Its the 20th anniversary of another election that Labour lost rather than the Conservatives winning it. They were playing audio clips of Kinnock at the Sheffield rally on Radio 5 this weekend. It still makes one’s toes curl in embarassment. Neil M: Indeed. Yesterday BBC Parliament replayed coverage of the 1992 general election – the last election in which the Conservative Party was actually returned with an overall majority. After getting over how young they all looked it was entertaining to watch Mr Blair explain how Labour lost an election. Well, we could have had M. Heseltine. But he was considered a loose cannon as his temper got the better of him on occasion. But, he would have made a better leader than Thatcher. However, the country so was desperate for a new style of government they fell for the Blair creatures line which promised modern socilaism, not Tory avarice. And look what he served up instead. Made a fortune out of it at our expense. however, we are once again coming to a point when none of the three main parties have any chance of outright selection. One of the major reason being political correctness and the noose that is around our necks. The other is the folow up of the Blair style of placing himself at the centre for the main chance. These Eton boys we have come across as close to Boy Mulcaster (Brideshead Revisited) as you can get. And they are as blind to it bats flying in the light when it’s mentioned to them. Out of touch and out of office. When you changed your format, why didn’t you add an edit button, so those of us who need to correct our mistakes can do so before the world sees just how dim we are? It would have been a good move for your blog as well as for me, on a personal level. Honestly. maudie33: I should explain that any changes are done by WordPress. I haven’t changed any features.